IL-1β (IL1B) is a proinflammatory cytokine that plays a key role in inflammation in blood vessels. A researcher interested in the lineage-specific response to IL1B can use HumanBase to predict the genes mostly likely to respond to IL1B stimulation. Using the blood vessel network, HumanBase can provide experimentally testable hypotheses about the tissue-specific responses to IL1B perturbations. Search for IL1B by typing the gene symbol, aliases or Entrez ID into the search box on the main page (or below as an example). Submitting the search will bring you to the IL1B gene page. From that page, you can select a tissue network of interest. Below is the blood vessel network for IL1B. Each edge represents a predicted relationship between two genes. For example, CCL2 and IL1B are predicted to participate in similar biological processes in blood vessel with a high probability (.85). These high-confident relationships (i.e. genes with confident edges to IL1B in the displayed network) serve as potential hypotheses for responses to IL-1β stimulation in blood vessel cells, and are excellent candidates for experimental follow-up. We anticipated that the genes most tightly connected to IL1B in the blood vessel network would be among those responding to IL-1β stimulation in blood vessel cells (identified in step 2 and shown below). We experimentally tested this hypothesis by profiling the gene expression of human aortic smooth muscle cells (HASMCs; the predominant cell type in blood vessels) stimulated with IL-1β. Examination of the genes whose expression was significantly upregulated at 2 h after stimulation showed that 18 of the 20 IL1B network neighbors were among the top 500 most upregulated genes in the experiment (P = 2.07 × 10−23; below). The bar plot below shows the differential expression levels of the 20 IL1B neighbors measured in a microarray experiment at 0 hours and 2 hours after IL1B stimularion. Each bar represents the gene's log ratio of mean expression at 2 hours over its mean expression at 0 hours. 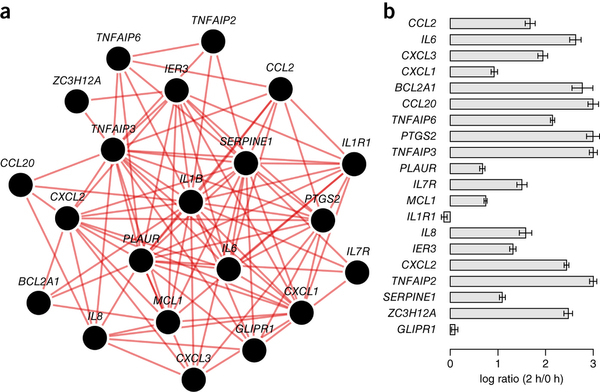 Eighteen of the 20 IL1B network neighbors were found to be among the most significantly differentially expressed genes.